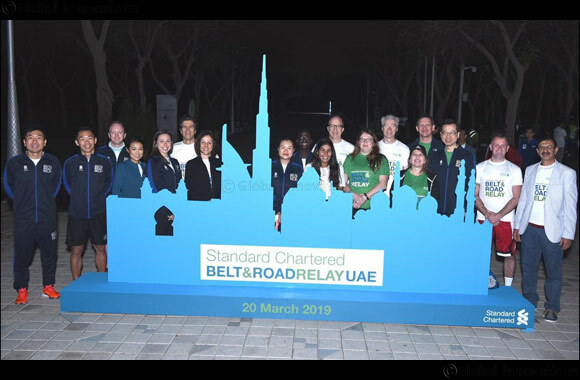 21 March 2019, Dubai – Standard Chartered recently announced the launch of the Standard Chartered Belt & Road Relay, the first-ever global running event spanning the Belt and Road initiative. The Relay aims to highlight the Bank's continued commitment to Belt and Road, and the positive impact of the initiative to communities and businesses globally. The Relay will be led by eight staff athletes from Standard Chartered, selected from the Bank's diverse footprint across Asia, Africa, the Middle East, and Europe and the Americas. These athletes will participate in running events across 44 Belt and Road markets within a 90-day period. The Standard Chartered Belt & Road Relay kicked off in Hong Kong on 17 February, in conjunction with the Standard Chartered Hong Kong Marathon. Followed by the UAE stop on 20 March, the Relay will conclude in China on 11 May after the Belt and Road Forum. The Belt & Road initiative and the opportunities around it, has been a hot topic on the UAE's agenda. Earlier this month, the Crown Prince of Dubai His Highness Sheikh Hamdan bin Mohammed bin Rashid Al Maktoum approved and announced the Dubai Silk Road Strategy to focus on enhancing strategic and operational connection of logistics services and build on Dubai's success as a vital trade link between east and west, and north and south. “We are always looking for ways to further demonstrate our commitment, raise awareness for the Belt and Road initiative in the UAE, and enhance cross border relations. As an international organisation with a deep-rooted history across Africa, Asia and the Middle East, this initiative is strongly aligned with the footprint of the Bank. Similarly, with its position as trade hub between Asia and Africa, we see a see real benefits to the UAE arising from the Belt and Road project and believe the country can play a key role in promoting this initiative to the world.” she added.